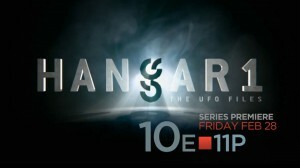 A new UFO television show from the History channel premieres on Friday, February 28 titled Hangar 1: The UFO Files. The premise of each episode is to examine a number of MUFON cases, looking for patterns that tie in to historic UFO events and try to show what the alien agenda may be. Actual footage and recreations will be used along with expert testimony. The “HANGAR 1” title comes from the actual Hangar One where the vast archive of 75,000 MUFON cases and evidence are stored, including the Leonard Stringfield files. The show will showcase MUFON’s mission to educate the public about the UFO phenomenon. UFO investigators, researchers, and journalists present case details in the show, while event recreations help the viewer to better visualize the cases as they are described. Hangar 1 features MUFON’s Pennsylvania state director John Ventre, MUFON STAR Team investigator Jeremy Ray, and Jason McClellan of Open Minds. Richard Dolan, Grant Cameron, Leslie Kean, Michael Schratt, and MUFON’s executive director Jan Harzan make appearances in the series as well. From Truman to Obama, our modern day Presidents have all had rich and controversial histories with UFOs and extraterrestrials. In fact, Eisenhower, Nixon, Carter, and Reagan are each rumored to have had personal encounters. Inside HANGAR 1, MUFON files ask, “What do our presidents really know about the existence of UFOs?” Are some Presidents kept in the dark because they aren’t trusted with that knowledge and how they might use it? Or, are they all aware, but the secrets are too dark and deep that full disclosure becomes a risk they just can’t take? Following the premiere, this eight-episode series will continue to air new episodes every Friday. when will the new series start ?